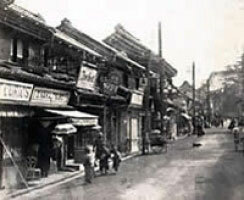 The history of Motomachi Shopping Street goes way back at the time of the opening of Yokohama seaport in 1859 (6 Ansei.) 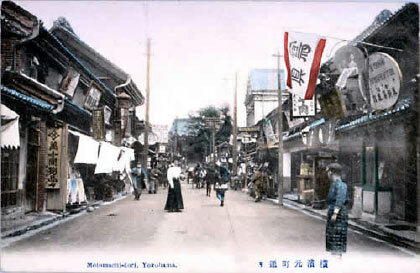 That is to say Motomachi came into existence when Yokohama village was divided into two districts, a Japanese business district and a foreigners residential district, located on either side of Nippon Oo-dohri or Nippon Main Street. 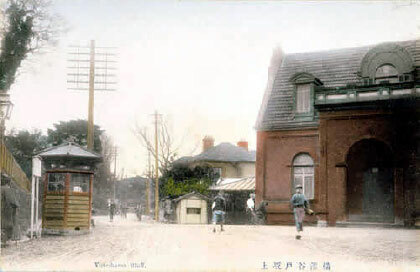 Thereafter, in January 1860 (1 Man-en,) ninety residents of Yokohama village were ordered to move out to a nearby village calledMotomura, and in the following February, "Motomura" was renamed to "Yokohama Motomachi." The road from the main Yamate Hondori to Washinzaka-dori was named Bluff (from its area) since the time of Westerners residences. Foreign General Cemetery was set when sailor Robert Williams of US Admiral Perry's fleet died and was first buried here. Motomachi Park was built with the swimming pool in the early Showa with the area of 2 hectares. In 1867 (Keio 3) the Westerners moved their residences to Yamate and commuted to their business establishments passing through Motomachi Street. People who lived in Motomachi were formerly farmers and fishermen naturally started to do business to them and Motomachi became an exotic shopping street. The name Daikan-zaka originates from the noted landlord Ishikawa Family who resided in the mid-hill. Yokohama-mura area was under the control of Kanagawa Magistrate but Commodore Perry paid respect to the landlord Ishikawa and the name of this slope derived. 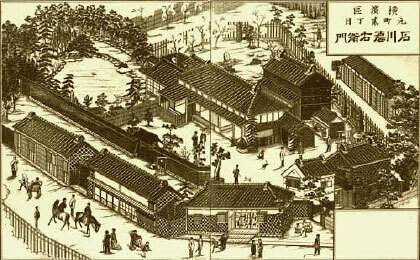 (Daikan=local administrator) Around Meiji 20 (1887) the Ishikawa residence was called Daikan-yashiki and the slope formally Minowa-zaka was called Daikan-zaka. Motomachi Itsukushima Shrine, 208, 5 chome, Motomachi located on the hillock between 4 chome and 5 chome of Motomachi. 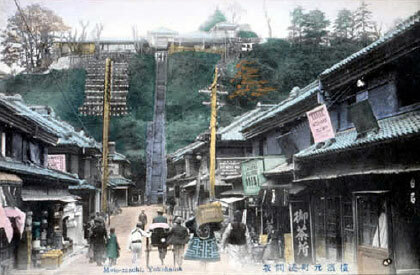 In 1869 (Meiji 2 ), the shrine had been moved from the island of original Yokohama Village is built with Red Gate (Torii) and up the steps, there is the main shrine, on the left is the Koutaijingu and further left Kotohira shrine. 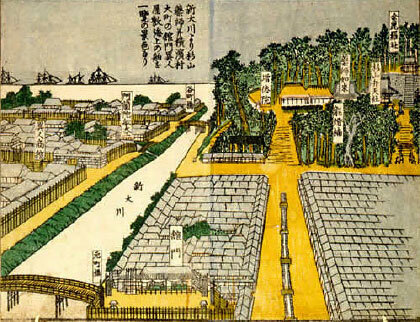 Until the Kanto great earthquake of 1923, there was a teahouse adjacent to Sengen Shrine, then situated on the hill to view the city and the harbor. 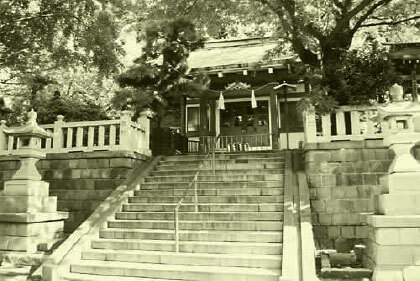 The shrine stood at the top of the One Hundred Steps that began at the street from Maeda Bridge.The present bridge was reconstructed in 1983(Showa 58). After the war, daily life gradually settled and Motomachi Street became crowded with families of US troops residing in Yamate and Honmoku. 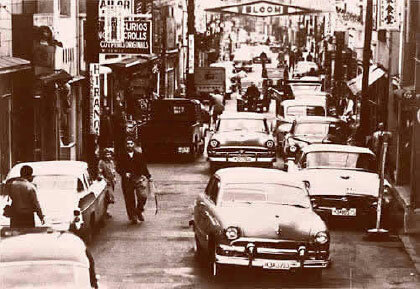 Pedestrians could not shop through the windows because of large cars driven by the Americans who came shopping and the Occupation Troops ordered the street to be one-way traffic. 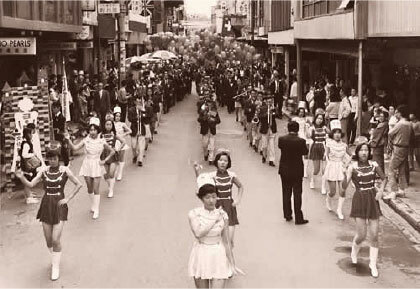 At that time, this Motomachi S. S. Kai was simply a voluntary association. But in December of 1950 (25 Showa,) it was first registered as Motomachi Shopping Street Cooperative in accordance with the Laws of Small Business Cooperative, and later this registered name was changed to Cooperative Motomachi S. S. Kai in January of 1952 (27 Showa.). Incidentally, the prosperity which was upheld by the demands of theseerican servicemen and their families did not last too long, because the Korean War broke out in 1952 (27 Showa) which rendered the American military base to be de-requisitioned. At that time the majority of the regular customers of the Shopping Street were these servicemen and their families, so when most of these men were to be transferred out of the country, the Shopping Street was faced with yet another crossroads. Eventually, Motomachi Shopping Street had to embark on designing a brand new town tailored to fit the needs of the Japanese younger generations while preserving the tradition of Motomachi at the same time. In 1955 (Showa 30) the city of Yokohama mandated the retreat of wall surface lines. All members of the Motomachi S.S. Association actualized the setback of 1.8 meters taking 30 years to complete. 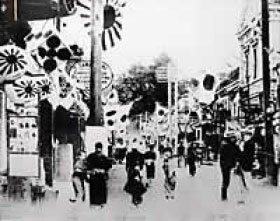 In 1967 (Showa 42) Motomachi signed sister-street agreement with the major European shopping streets to deepen the goodwill. The ladies magazine featured the fashion of high society young ladies and named it, "HAMATORA", shortening from Yokohama Traditional. The students from Ferris Ladies College and Saint Maur's wore casual fashions sold in Motomachi and became nationally known. After 1979 (54 Showa,) the members of Motomachi S. S. Kai started conducting studies on how to subsist in this ever changing environment. The outcome of the studies was to carry out a Street renovation project in August 1985 (60 Showa,) which included the widening of the Street, laying electrical cables underground, and others. 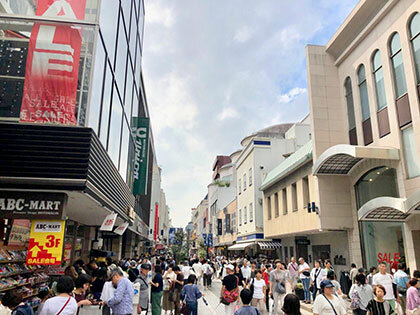 It now gives off a classy atmosphere to the Street space lined with attractive and distinctive shops.It can be said that the history of Motomachi Shopping Street has been made through its repeated efforts in finding its way out of the predicaments and continuing to create its own future. 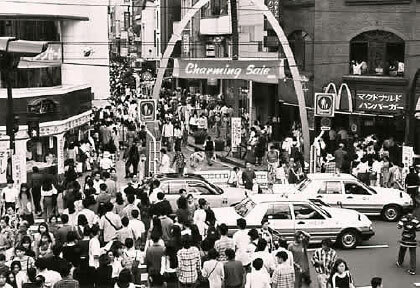 In 1985 (Showa 60), Phoenix was constructed as the symbol of Motomachi , the second street renovation. 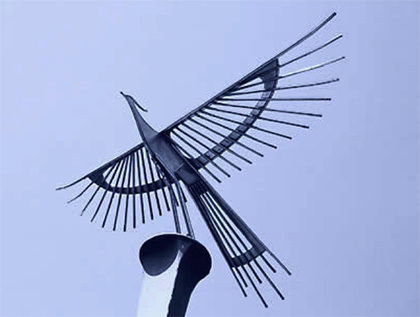 Authentic spirit of tradition but always with new challenges 'Fly through the Light' as the image of Motomachi. The arch is 10.5meters in height, and on top of it, stainless steel piped phoenix sizes 4.8mters in width and 2.3meters in height. © Yokohama Motomachi Shopping Street Association. All rights reserved.